HAVANA (CNS) — As Cubans finally face the prospects of calmer relationships and greater ease of communication and commerce with the United States, Pope Francis told the Cuban people that love and service, not anyone’s ideology, are the keys to their happiness. “We do not serve ideas, we serve people,” the pope told hundreds of thousands of people gathered in Havana’s Revolution Square for Mass Sept. 20. For decades the square has been the site of major communist government rallies and is dominated by a huge image of Ernesto “Che” Guevara, an Argentine Marxist who became a leader in the Cuban Revolution of the 1950s. The image of Che was prominent at the pope’s Mass, but so was a banner proclaiming Pope Francis a “missionary of mercy” and an even bigger image of the merciful Jesus. After decades of communism, Mass attendance in Cuba is low; even the Vatican reports that only 60 percent of the population is baptized Catholic. But as a sign of the pope’s hopes for the growth of the church in Cuba, he granted an exception to his normal practice of personally giving Communion only to the altar servers and other ministers at his public Masses. Five Cuban children received their first Communion from the pope at the Mass. In his homily, Pope Francis focused on an aspect of Jesus’ ministry that he tries to imitate: First of all, identify the good in a person, then help or challenge him or her to build on that good instinct or behavior. Using the normal Sunday Mass readings, the pope’s homily was a reflection on the Gospel passage from St. Mark in which the disciples are arguing about who among them is the greatest, and Jesus asks what they were discussing. “We, too, can be caught up in these same arguments: Who is the most important?” the pope said. In the lives of individuals and nations, he said, the question of who is most important can take on historic importance because it motivates action and choices. “The history of humanity has been marked by the answer we give to this question,” he said. Jesus takes “our searching, our aspirations, and he gives them a new horizon” and challenges people, he said. Jesus sets aside the “right answers” and replaces them with the standard of love as the measure of all. Love, he said, is lived in a concrete commitment to caring for others — especially the most vulnerable. It does not see superiority, or the best jobs with the best benefits and it is not about helping just “my people” or “our people,” he said. Such an attitude always leads to judging and excluding some people as outsiders. “Being a Christian entails promoting the dignity of our brothers and sisters, fighting for it, living for it,” he said. 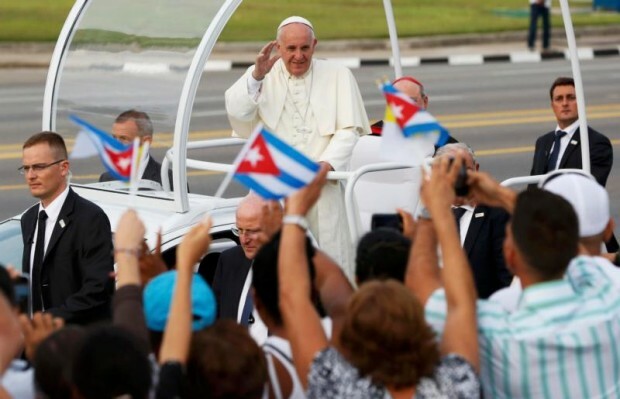 Pope Francis said he knows the Cuban people and the Catholic Church in Cuba have suffered. Yet, he said, they still know how to celebrate, to praise God and to serve others. The greatness of a people and a nation, he said, is how it serves the vulnerable. Normal, friendly and cooperative relations, the cardinal said, should reach not just the highest political levels in both countries, but also promote reconciliation between people in Cuba and Cubans who emigrated. “Only love and forgiveness among us will be a valid means for a true and peaceful renewal of our Cuban nation,” the cardinal said. NEXT: Local parishioner will conduct choirs for papal Masses in Phila.